HAASS: Well, good evening. It is evening, officially. Welcome to the 2019 Corporate Conference of the Council on Foreign Relations. I’m Richard Haass, and I am fortunate enough to be president of this organization. And I want to thank you all for coming here tonight. And I want to thank you also for being with us so often during the year. Before I begin I’d like to just do one or two things of housekeeping, to take a moment to thank the members of our Committee on Corporate Affairs who have joined us for this conference. Chaired by—the committee’s chaired by Blair Effron. I want to thank Council’s chairman, David Rubenstein, who you’ll be hearing from in a few minutes. I want to acknowledge Suzanne Helm, who’s our vice president for all things corporate, and her entire team and staff, for what they do with and for this organization. I want to thank all the companies who are part of our Corporate Program. And it’s not just for your financial support, though I do appreciate that, but also for the perspectives you all bring to our meetings and to other—to our other initiatives here. It adds to the quality of what it is we do and what it is we think and what it is we say. Over the next day we’ll be discussing everything from the changing nature of the economy, global trade, geopolitical risk. We will also have breakout sessions on virtually every region of the world and all sorts of functional issues. And then we’d like to think that it’s this nexus of policy and business that sets apart the Council on Foreign Relations and the Corporate Program. I’d just say that I think doing this, while it’s always important, it is particularly important at this time. When you look at the challenges that our societies and our economies are facing; when you look at the challenges in the world, be it at the regional level or the global level; this is actually, I think, one of the—potentially one of the most consequential moments in modern history, and not a lot is inevitable. And decisions that people take will, I believe, have all sorts of implications for your businesses but also for your lives as citizens. Tonight, to kick us off, we are fortunate and then some to have a conversation between Jamie Dimon, who as you all know is chairman and CEO of JPMorgan Chase—full disclosure, I bank with them—(laughter)—unfortunate disclosure; it so does not move the needle—and David Rubenstein, who as I said is our chairman and also the cofounder and co-executive chairman of The Carlyle Group. Our timing could not be better. And the reason is not just for what’s going on in the world, but several hours ago Jamie released his annual letter to shareholders. I urge you to read it if you haven’t already. And to me, it’s the sort of thing we don’t see enough of. Too often the business world is hived off from the world of public policy and politics, and it’s—you know, whether you agree with everything he wrote or not, let’s put that aside for a second. What to me is so also just welcoming about it is that someone in a position of responsibility and visibility is weighing in on these matters. We simply don’t have enough corporate statesmen, and my view is we are fortunate tonight to have not just one but two of them leading us off tonight. DIMON: You want this side? That says “David.” OK.
OK. Let me just say at the beginning, unlike what we often say, this is on the record. This is not off the record; this is on the record. So I think there are some press here. And let me also say that this event is sponsored and underwritten by Bernard L. Schwartz, who is here. This is the Bernard L. Schwartz Annual Lecture on Foreign Policy and Economic Growth. And Bernard, as some of you may know—I’ve said before—is a newlywed, and his wife, Denise, is here. Thank you both for coming and thank you for underwriting this event. And Bernard, as many know, was a great leader at Loral for many, many years, and retired at the young age of eighty from being CEO. And I often ask him whether he wishes he had stayed on until he was—he’s now ninety-three. So I have no doubt that he could have done a great job as CEO as ninety-three. RUBENSTEIN: Twice. (Laughter.) When Jamie left Citi, I did go to see him and I said, you know, you should be in the highest calling of mankind, private equity. (Laughter.) And he—I couldn’t persuade him. And then actually another time I went and said, you know, we’re going to take our company public, we didn’t really have the right person to be the CEO compared to you; why don’t you leave JPMorgan, you know, and that, you know, bank is—you know, a lot of banks around there, but you could run a private-equity firm. What could be better? I failed in both efforts. But I greatly admire Jamie for a number of reasons that Richard mentioned. Just to give you a little background, Jamie is from this area, from the New York Area. Went to Tufts, Harvard Business School. And went to work after Harvard Business School for Sandy Weill, then at American Express. When Sandy left American Express, he went with him. And ultimately, they built a company out of commercial credit, which was in my hometown of Baltimore, and they ultimately helped create in effect Citicorp. Jamie left Citicorp, ultimately became the person who ran Bank One in Chicago and moved to Chicago. Came back here when Bank One was acquired by JPMorgan, and then has been running JPMorgan since really 2006. Since that time the market capitalization has gone from 143 billion (dollars) to 343 billion (dollars). And if you had bought the stock, you would know that it’s probably up by about 165 percent since Jamie has been running it, and the bank is without doubt the most successful bank in the world. And I think Jamie, it’s fair to say that he’s the most-admired, most-respected, and most-quoted banker in the world. So we’ll have some no doubt good quotes tonight, but let me start with this report that Richard referred to. And again, I highly recommend it because I’ve read, you know, thousands of annual reports, and rarely do you see annual reports that go into public policy as much as this one does. So why do you spend so much time on public policy in your annual report? DIMON: So welcome. Thrilled to be here. David, thanks for those very overly-kind words. You know, I always write long annual reports. I always ask myself the most important questions—what you want to know as a shareholder, employee. But obviously, I think in the last several years—and you all know this—one of the most important things has become public policy. And, you know, I have this deep frustration for what’s gone wrong in the United States over the last I’m going to call it twenty years, for a wide variety of reasons. So I like to take the time to study the issues, to write down what I think, and you know, give it a different kind of perspective, whether it’s all exactly right or not. 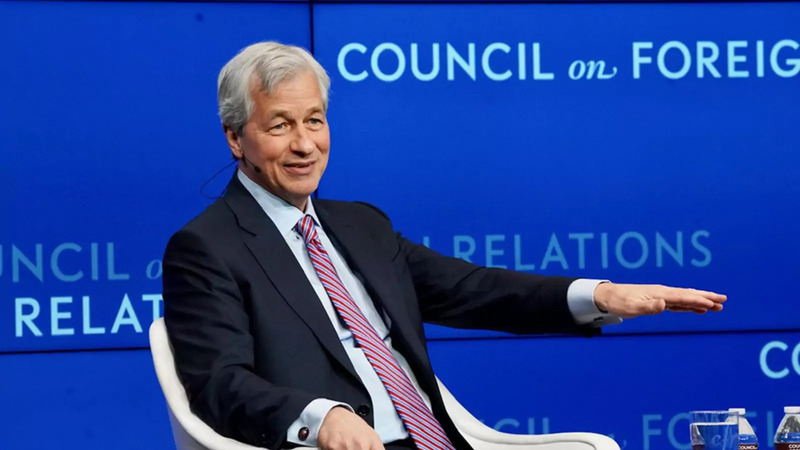 And so—and it’s—just from that I think—if you said what’s the most important thing for JPMorgan now, it is a really healthy world and a really healthy United States. What’s one of the most important things for the world? A really healthy and strong United States. And, you know, one of the lines in there says if we don’t fix some of these problems our economic, moral, and military dominance may cease to exist, and I—and I believe that. I’m not talking about five years from now; I’m talking about over the next twenty or thirty years as we tear ourselves apart over things which we really should have fixed. RUBENSTEIN: Well, Jamie, it is reported that last year you thought about running for president of the United States and you actually said you would enjoy the job. In light of the fact that nobody yet has emerged as somebody that people say this person should be president of the United States who’s going to challenge President Trump, have you ever rethought your position about running for president? DIMON: No. I tell people I thought that I should think about it—(laughter)—and should I think about it seriously. I never did any work or any polling or any of that. I did think about it and decided not to. Not to—not to even think any more about it, basically, and I didn’t do any real work. If I was going to really think about it I would have spoken to fifty people, I would have done my homework, you know, which I didn’t do any of that. So it was blown out of proportion, partially because I make silly jokes about I’d love to be president, but you know, if you anoint me. You know, but I’m not going to go run—(laughs)—and so, no, I’m not—I’m not going to rethink it. I love what I do, and I think if I do a really good job here and, you know—and I’m the chairman of The Business Roundtable, I can help influence things to the better too. RUBENSTEIN: Let’s suppose somebody’s elected president of the United States like the current president and the person says to you I’d like you to be secretary of state, secretary of treasury. Would you consider going in an appointed job? DIMON: I would never not consider a request like that from a president of the United States. RUBENSTEIN: But the current president asked you to consider that and you decided at that time not to do it? DIMON: And immediately—(laughter)—a tweet came out how I was the worst banker ever. DIMON: Immediately, which I knew was going to happen. DIMON: No, but just so you know, I—look, I did speak to people about that, quite a few people. But I actually thought the president would be better served by having people who had been on the bus with him. I really mean that—you know, people who he knew, he had earned some trust with. And, you know, Steve Mnuchin I think is a very capable guy, and he had been on the bus with him for six months. I think that’s just a different thing than you’re one of—a new person being thrown into—you know, into a situation you don’t necessarily completely understand, so. RUBENSTEIN: Let me ask another question related to your tenure at JPMorgan. You’ve done extremely well. The bank has done well. No bank is more successful. But are you ever worried that the financial gods might wake up and say: Jamie, you’ve had so much good luck in the last decade or so, or good fortune I should say; maybe you should get out at the top and just leave early and just do something else? You ever thought about that? DIMON: I only think about that when people mention it to me. DIMON: You know, it is—but it is true. Something can go wrong and all of a sudden, you know, you regret. But I love what I do. I love my company. I love my country. I love the things that I get done here. I’m not ready to—the company’s not ready for—it won’t be up to me, but it’s up to my board of directors, just so you know. And so, yeah, look, one thing that you know about, like, the falling off the pedestal, you’re going to fall of the pedestal, right? So I always—don’t put me on the pedestal. Just stop that. Companies make mistakes, and CEOs make mistakes, and bad things happen. And so it becomes a sport with a press, but in my view is, you can have mistakes. And I’m sure I’ll have other mistakes as I go forward. But I hope we’ll do just as well in the next ten years as we did in the prior ten. DIMON: So—you know that song, The Boy Named Sue? (Laughter.) You know, when you have the name Jamie that does happen quite a bit. And, you know, you got to learn to defend yourself a little bit. It’s a girl’s name. So when I was about four or—not four or five—like, fourth grade, I tried to change my name to Jimmy. But my mother would not call me anything but Jamie. My father wouldn’t call me anything but Jamie. My brothers wouldn’t call me anything but Jamie. My friends wouldn’t call me—so I tried for about six months and dropped it. I never—I never thought about it again. RUBENSTEIN: All right. So you went to Harvard Business School. And afterwards you had offers from Goldman Sachs and many other well-known firms. But you decided to go work for one person, Sandy Weill. Why did you do that, as opposed to going to a very prestigious investment bank? Because Sandy had—I’d gotten to know him a little bit. My dad was a broker at Shearson Hamill. I’d had a summer job there. You know, he liked the fact that I went to Harvard Business School. And his pitch was this: I’m not going to pay you the same—well, he’d tried to hire me as an investment banker at Shearson. So it was Shearson Hayden Stone at the time. And I basically played to him no, because you just learn so much more and you get paid more at some place like Goldman Sachs. But he said: Come join me here. I don’t know what it’s going to be, but at least you’ll see what a big company looks like. What I loved about—firstly, he was very down to earth. I mean, there are flaws in the man, but he’s very down to earth. And I really wanted to help build something. I mean, that was my initial thing. Like, I want to build something. He had built Shearson Hamill from the—you know, Shearson Hayden Stone they—a lot of acquisitions kind of from the ground up. I loved that kind of story. So if figured I can always go back to investment banking. Let me try this. This I won’t get offered again. RUBENSTEIN: After you were there for a while he got fired. RUBENSTEIN: And you decided to go with him, rather than stay there at the organization. Did you ever think you were going to build up an organization as big as you ultimately built up? RUBENSTEIN: Did you try to buy Bank of America? DIMON: We tried to do something with Bank of America. And talk about tilting windmills. And so Commercial Credit was this little crummy consumer finance company, which also owned a hotel in Scotland, and some leasing equipment in Ireland, Israel, but it was a platform. And he just wanted to get back to work. You know, it was—that was it. This is—we’re going to build this company. And, you know, I—Jim Robinson made me an offer to stay there at American Express. But, again, I wanted to try to build something. And I didn’t know what was going to happen. We were out of work for a year and a half, so it was for me a little bit more of a hardship. RUBENSTEIN: Let’s go—when you were at Travelers and then you—I guess Sandy went to John Reed, who was then the CEO of Citicorp, and said: Let’s have a merger, co-CEOs. And John Reed said OK. And you were going to be the president under the two of them. How did that work out, with the two CEOs? And so we did the deal. Originally—and this is a management lesson. Originally it was structured. I was not going to be the president. I was going to run the Global Corporate Investment Bank as the CEO. Someone was going to run Global Consumers. Someone was go Global Asset Management. Someone was going to run something else. And risk, finance, and technology was going to report to me, which was completely appropriate since I knew more about those three things that either Sandy or John. There were complaints by other people in the company—which John Reed said, who cares? This is the right organization. And then we ended up doing the following, OK? Tri-heads running the Global Corporate Investment Bank reporting to Sandy and John. Co-heads of everything else reporting to Sandy and John. And the staff functions reported to Sandy and John. And I had some titular responsibility for financial risk. And so I start fighting with them right away saying: This is crazy. You are going to destroy the company. We are going to lose all the good people. And John didn’t think it would matter that much, and Sandy, you know, thought it was going to be OK. I said, you’re going to destroy the company. It’s just a matter of time. And I said, you’re going to lose a lot of senior people. I didn’t realize I’d be the first one. (Laughter.) But I told them—I was just dead right. I mean, a bad organization like that, with the politics that takes place in mergers and stuff like that. And they’re kind of response was, hey, it works for us. And my response was, it doesn’t matter what works for you. It matters what works for the clients and the 250,000 people who work here. And, you know, basically it was a huge error. And the churning of people after that, and it was just a mistake. DIMON: You know, look, I had—I had 100 people at my apartment, you know, recruiting, OK? And they said—we were meeting that Sunday at 4:00. They said, can you come at 1:00? I said, no, I have this brunch with all these kids. And they said, you got to come. It’s very important. And so I walked in the room. There’s two of them and me. And I sat down. And a lot of people in the company said: It doesn’t work. You got to change it. So we knew there might be change coming, because it just simply didn’t work. And they said to me, well, we’ve made some decisions and we want to share them with you. And I said, yes? And they said, well, we’re going to have this person run the Global Corporate Investment Bank. I said, well, that’s kind of my job, but—I was shocked who it was. They said, we’re going to have this person do this, and we want you to resign. Which I said, OK. And they said—you know, and then Chuck Prince came in. We did the little press release. I did the press from home. RUBENSTEIN: What did—how did you tell your—how did you tell your kids that you’d been fired? DIMON: Listen, it was—and by the second that happened, I knew exactly the board had been spoken to, the press release had been written. And, you know, Sandy and I hadn’t been getting along for five years. I mean, it wasn’t immediate. Of course, I should have known. I mean, you know, I missed a very stupid thing, that I thought eventually it would work out, we’d be OK. I was obviously the logical person to run Citi, though it hadn’t been decided. So I got home. I told my kids—I walked in and my daughters—I said, girls. I have three daughters and I think they were like twelve, ten, and eight. I said: Girls, I have to tell you something. I’d already told my wife. My wife, by the way, always think I’m kidding. So I said: Judy, I’m going to tell you something and I’m really, really, really not kidding. (Laughter.) OK, I just got fired. RUBENSTEIN: So I remember you took an office—you had an office in the Seagram Building. I came to see you there. And I said, look, private equity is great. And you said, I’m not quite ready to join private equity. But you had an offer to go to Amazon to be the number-two person. DIMON: I didn’t have an offer. I took all the calls that were made. I looked at—I thought all these things were going to fail. I was offered a bunch of those. And I got a call about Jeff. I thought the world of him. We had a great lunch. I went to a town hall, he says which he never allows people in. And we hit it off. We’ve been friends ever since. And I just—it appealed to me a little bit to, like, move—remember, Sleepless in Seattle can come out, like, a couple years earlier. And get a houseboat and never put a suit on again. And I thought he had a real opportunity to build something, unlike some of these other companies. It just was a bridge to far for my family, me. I’d spent my whole life in financial services. And so I decided I should probably find something in financial services. RUBENSTEIN: The Bank One deal came along. And you moved to Chicago. And people there didn’t think you were going to stay there very long. They kept saying you were moving back to New York. RUBENSTEIN: All right. So ultimately after four years there the bank did well, and you did the merger with JPMorgan. So when you took over JPMorgan, things did OK for a while, but then the great financial crisis came. And when the financial crisis came, were you worried that JPMorgan was not able to withstand it? Or you never worried that JPMorgan couldn’t survive? DIMON: No. JPMorgan—when it happened—first of all, we—just—we had a lot more capital than everybody. I’m a very conservative person, OK? We had a lot of liquidity. To give you—and I forgot how much, I mean, 100 billion (dollars) sitting in a—literally sitting around, like. And I started to raise more. But to give you a feeling for how conservative I am, a lot of these banks at the time, particularly the Europeans, were funding their balance sheet 20-30 percent or more in what I would call unsecured wholesale funding, which is the most fickle funding in the world. It’s commercial paper, interbank deposits, certain types of CDs, Eurodollars. And it’s the most fickle because it dries up the second there’s a problem. I mean, and that goes. So they had 30 percent. We had zero. And I mean zero. I didn’t do it. We had a little bit of commercial paper, only because clients said I want to sweep into commercial paper accounts, and stuff like that. We had repo, which is secured and all that. And so when we were making good money, and we were on the ball. And there were some scary moments. The scariest moment is when—the weekend when Lehman was going bankrupt, I—all our executives, I called them up. Everybody went back to work. Pretty much worked around the clock for six months. I mean—but driving home I called the board. And the conversation was the following: That I told them I thought Lehman—this is Sunday night—I thought Lehman is going to declare bankruptcy either tonight or tomorrow. I’m not sure. I said, and it’s very possible throughout the rest of this week you’re talking about Goldman, Morgan, Bank of America, and I’m pretty sure AIG’s not going to make it, because we had already been working on that. And they said, well, what does it mean? I said, look, we—you know, our—we have net zero positions in all those parties. But you got to remember, we have huge relationships, where we track what we call global market counterparties. We’re hedged on every single little thing. Now, of course, they can swing at night and stuff like that, so those exposures could go to $1 billion, or you could get locked out of contracts. But the fact is, it was—it could be a billion dollars, plus or minus, for any one of them. But that was about it. And because of the crisis, the money was flowing into JPMorgan. So our balances were going up like this. People were pulling money out of bank after bank. And some of the governments—and this is—I’m going to write a book one day. Some of the governments make it worse, because they started guaranteed deposits. What happened—Ireland did it, Germany did. And the second that happened you guaranteed the default of banks, because now all of a sudden they had a guarantee choice as opposed to deposit to the bank. And so—and it also made the weaker banks weaker. The healthier—those good banks got it. Everyone else was, like, move all your money. And so the money started sloshing around the world, draining out of certain people and draining into other people. RUBENSTEIN: One of the problems was that Bear Stearns went under, was about to go under, and the government of the United States said: We want you to do a favor for the American people and save Bear Stearns. So you bought Bear Stearns. And then later, the government of the United States sued you for buying Bear Stearns, in effect. So what did you think about that? DIMON: Not in effect. They stole from us afterwards. It was—I thought it was terrible, you know? And I—we bought Bear. We bought it for a billion dollars. It had been worth twenty (billion dollars). But you know, it was—we’d put $12 billion of reserves the day we bought it to manage the extralegal risk, the closedown cost, the severance cost. What I all de-risking—we had just bought $300 billion of assets. We knew them. We had been through every loan, and every bond, and every—but, remember, it just doubled up what we already had. So of that 300 (billion dollars), I knew I had to get rid of 150 (billion dollars) quickly in bad markets. Right after I told you things are really bad, that’s when I had to sell. And so, you know, someone was saying me at the point, well, things are going to get better for you. And I said, no, they’re going to get worse, because everyone’s going to say what the hell happened? You know, how bad is it, and where is it. And I did ask—I was worried about the SEC enforcement actions. And I did get a letter, which is public, from the acting head of the SEC saying that they couldn’t say we’re not going to bring enforcement actions against you, but they said—and even our lawyers were shocked, but I insisted I want this letter—but the letter said, if we bring an enforcement—if we bring enforcement actions we will take into consideration the circumstances in which you bought Bear Stearns. It didn’t occur to me to ask the government or the DOJ to do that. So when they started coming after us for all these mortgage losses, you know ,we paid well in excess of $10 billion, 80 percent of that related to Bear Stearns and WaMu. So when I went to see Eric Holder, thought I was going to come in, pound the table. I said, Eric, I’m here to surrender. You’re my judge, my jury, and my hangman. I have no court to go to. There is no court for an American bank, OK? I would lose anywhere, OK? And you guys are threatening something that’s life or death for a financial company. I am going to surrender. I brought one of my directors. I wanted them to hear the whole conversation back and forth. And he eventually said—I said—I said, and the mortgage stuff, 80 percent was Bear and WaMu. Let me tell you the circumstances of that before you pass judgement. And so he says he gave us a discount. I don’t know. It should have been zero. It wasn’t right. And I would never even take a phone call like that again. RUBENSTEIN: Well, so if you go to where we are today. Among the things that people worry about, and probably you as well, is Brexit. Are you worried about the British economy and the European economy? And what is your plan if Brexit occurs? DIMON: So we’re—again, we’ve always thought JPMorgan had to be ready for a hard Brexit. And we’re ready. It’s a lot of work. It’s been a lot of money. It’s probably a waste of money. We had no choice. I don’t know what’s going to happen, but we’re ready. All we—I won’t go through the legal stuff and the capital and all that stuff, we’re ready. I don’t think a lot of companies are ready. So I think a hard Brexit would be a really bad thing very quickly. But think of it—the way you should think of it—and a soft Brexit it should just be—it’s like a soft Brexit is a bad remain and doesn’t really mean that much. I think over time London will, in either case, if there’s a Brexit of either case, they will become a minor financial center over time. So everyone focuses always on that one day. How many people are you moving, how much? Oh, it’s three hundred people. But over time we got sixteen thousand people in London, you know, of which twelve thousand basically serve European companies. Look of all research, all equity, all sales, all investment bankers, all tech, all risk, all legal, all credit union in one building—one beautiful functioning data center and building in London or outside of London. And the regulators and politicians will simply demand over time that we move some of that. That’s all. I don’t understand why people don’t understand that. And so—but a hard Brexit will be a really bad recession in Britain. It’ll be not so great for Europe. It won’t affect America that much. So it’s not an Earth-shattering thing; it’s just a bad idea. It’s—Europe, by the way, has far serious problems. Far more serious problems that they have to fix if they want to keep the living standards of their people keeping up with the rest of the world around technology, innovation, and skills, and capital. And so, you know, wise people look at it and say: Brexit does point out that there are severe issues with Europe. You know, not that the people complained about leave are all right, but those fears about immigration and Brussels, you know, telling people what they can do and how they can eat—you know, all those fears, there’s some legitimate. And I hope that they use it to fix Europe too, so that everybody else wants to stay there. DIMON: Absolutely we should have entered into it. And, you know, President Obama came to the BRT a couple of times. And at one point he complained that you guys tell me how bad it is with China, and when I go there they tell me how great it is. None of you are willing to stand up or say anything. And I think it’s true. I think the business community has spent a lot of time, like, let me just worry about JPMorgan China not—you know, otherwise the Chinese could be punitive, you know, or something like that. There are—and now the BRT supports not the tariffs, but the issues, OK, about IP being stolen, non-bilateral investment rights, subsidies or benefits given to state-owned enterprise beyond what you would consider normal or fair in trade, nontariff barriers. You get the right to do it, but you can’t get the goods into the country. Those are serious issues that Japan, Europe, and America we all know are true. I think the Chinese know it’s true. So we’re glad—I think Lighthizer and Mnuchin have been doing a good job. I’m told that they’ve made a huge amount of progress in detail. We don’t want a soybean deal. You know, if they agree to buy $200 billion of goods a year from us for—that doesn’t fix the problem. And Europe—and we’re not coordinated, but Europe and Japan really want us to do this. We should have been part of the TPP. So I wasn’t in favor of the tariffs, and the threatening, and the stuff like that, but absolutely in facing the issue. And in fact, the business reason aside, our view is you have to deal with the serious issues. And if you don’t, we’re better off dealing with it now, whatever that means for the economy. DIMON: But I think they’re going to do one. I think both parties want it. But I also think it’s a bad idea to say they have to. They don’t have to, nor do we have to. RUBENSTEIN: You know, you have your pulse on the finger—your pulse on the U.S. economy. You see all the data from credit card companies that you own and so forth. What do you think the state of the U.S. economy is? Do you worry about a recession anytime in the near future? DIMON: Not really, because if you look at the—again, so China’s going to grow at 6 percent because they can. They can macro-manage in ways that—they can—they do—because it’s a state controlled in their companies, they simply can do monetary policy, fiscal policy, bank policy, industrial policy, you hire, you train, you build the road. And they will meet their objective of 6 percent growth. It’s not great growth. They’re building imbalances into the system which I think will eventually come to haunt them. But for the next couple years, they’re going to hit their targets. And then Japan’s doing, you know, 1 percent. Europe’s doing 1 percent. Brazil’s turned the corner. The United States is chugging along. You know, and forget the noise. And remember, all the geopolitical stuff affects markets and sentiment and all that, but—and obviously you see what it does in the fourth quarter. But unemployment’s going down, wages are going up, confidence is high. It’s not at the highest point. It was at almost the highest point of all time. Business confidence, consumer confidence, and now it’s still in the upper quartile. I think it’s coming down because of the shutdown, and trade, and Brexit, and a bunch of stuff. Housing’s in short supply. You don’t have the leveraged assets in the system like we had. There’s nothing like we had before. It doesn’t mean you can’t have a recession. So my view is this economy is plugging through. And Brexit, Venezuela, Russia, possible fiscal policy tightening, possible policy—bad policy errors, which I talk about in there, those are mounting issues that can easily derail and economy. But this could be more like just more straws on the camel’s back. Some combination of stuff affects confidence, affects CEO spending. And so we don’t see it now, but you, you know, you got to—you got to be prepared. We all should be prepared for something bad to happen, because bad things tend to happen. So it could easily be 2022. This notion it’s got to be 2019 or early ’20, that’s not true. RUBENSTEIN: But do you worry about the debt of the United States government? We have $22 trillion of federal debt. We’re adding 1.3 trillion (dollars) a year. Do you worry about this as a fact that could cause a recession? DIMON: What causes a recession is if the government goes into fiscal tightening or monetary tightening, where you have huge industrial imbalances, or there’s market—those things cause recessions. But I’m not worried about it. Here’s why you shouldn’t worry about it yet, OK? It’s—net debt is 80 percent of GDP. You know, in Japan it’s 200 percent. And when you owe debt to yourself—so we all own the country. And we all owe debt to ourselves, you’re just moving the income around between us, OK? And so the GDP growing, we can still take care of our people. And it’s not good politics. You want higher retirement money, and you want higher this, and I want higher that. And the government gets involved in all those things. Now, our debt is not owed 100 percent to us. Seven trillion (dollars) is owed to foreigners. But we own over $20 trillion of foreign assets. We earn a lot more in America on foreign assets than foreigners earn on American assets. So it’s not out of bounds, out of whack. And our economy is worth $100 trillion. So it’s not—that’s not a danger point. The eighty is going to go like this. And I forgot the when, but twenty-five years out it’s going to be at, like, 130 (trillion dollars). This whole hockey stick is medical costs—all of it. All of it. And if you were—and if we’re smart, which we are no longer—(laughter)—obviously you say: Let’s deal with that before it becomes a problem. Let’s change that trajectory, you know, because there will be a point where it will cause concern. You know, they’ll start talking about the credit crunch again, or, you know, crowding out of private capital, all these various things. So let’s deal with it. But it’s not going to cause a recession tomorrow, unless someone come in in the Congress and they cut spending dramatically. And that can. RUBENSTEIN: What is your experience? When you go to Washington to meet with members of Congress and administration do you find that they understand finance as well as you think they should, or? DIMON: I—look, you know, that’s—it’s a spectrum, you know? There are some very good people there, and very smart people, and you have the other side of the spectrum. And you know, I look at that as a job. I have to go see people, and talk to people, and try to educate people, and be honest with them when they point at things that we did wrong, we should have done better, stuff like that. And so I do find that the conversation—the lack of America doing proper thinking about public policy is why we’re only growing at 2 percent. And that’s why I’m frustrated and wrote this. RUBENSTEIN: All right, and talking about public policy, some of the things you’re most worried about are, for example, health care. You have a joint venture, I guess, with Jeff Bezos and now with Warren Buffett. What is that going to produce? DIMON: Yeah. So here’s what I’m really worried about, OK? And it’s hard to tell you exactly. I made a—and we’ve all seen the work. I studied lots of different stuff, and probably some of you in this room wrote some of it. We’ve grown at 20 percent of the last ten years. Sounds OK. It should have been 40 (percent). An average recovery in America, after a bad recession, would have been 40 percent, even with the recession in between by the way. That extra 20 percent is almost $4 trillion of GDP, OK? And then people come up with these theories, well, it’s secular stagnation. It’s the new normal. It’s the savings glut. I have no idea what they’re talking about. And so we made—I made a list of all the things that are hurting: health care, immigration, litigation, regulation—not all the things that are hurting, public policies which are critical to the health of a country. We get to travel around the world. We see countries everywhere. Infrastructure, health care, education, tax policy, all those things are critical to a country doing well. In all of those categories, we’ve deteriorated. Like, we’re not even in the top twenty in infrastructure. We can’t build—it takes ten years to get a permit to build a bridge. In education, you know, we used to have the best getting kids jobs, vocational jobs. Half the kids in inner cities don’t graduate. And in litigation—our litigation system costs 1.6 percent of GDP. The average OECD is 0.6 percent. Immigration, the economists will say it’s because we don’t have immigration—more merit based, get DACA, have a path to citizenship, let him build a damn wall. Let’s get immigration reform, 0.3 percent to growth. Mortgage reform, 0.2 percent to growth. You know, we’ve crippled mortgages for lower-paid people by all these certain regulations and stuff like that—(inaudible). And then there’s health care. Twenty percent—almost 20 percent of GDP. That’s twice everybody—the rest of the developed world. Now, if you’re in the health care business, you would tell me legitimately: We have the best. And we do. We have some of the best meta, pharma, hospitals, surgeons. But it’s not the best equally deployed, OK? Obesity is—25 percent of the cost is obesity, which drives cancer, heart disease, stroke, depression, diabetes. OK, end of life, 15 percent of costs. And it’s mostly—half of it’s unwanted because of laws—you know, the rush to hospitals, and people getting things they don’t really want. Chronic care is not probably dealt with. Wellness programs should be—I think they should be more coercive because of the obesity. Hell, we should be teaching nutrition, education—nutrition, wellness, and exercise in K-12. Like, what are we doing? And I go on and on about it. And so, I mean, Warren Buffett calls it the tapeworm of American business. You know, at what point is it going to cripple American business, having such an uncompetitive position on a major cost factor for your employees? And so, yeah. So my view—and the other thing, which is really important, you can’t pick up what I just said in a lot of models. And that’s what economists try to do. But you can’t. They don’t factor in health care going up like that. They don’t—like, health care, the longevity that’s given us over the last—which obviously is the best thing in the world. That longevity was, you know, some people estimate up to 50 percent of GDP growth, because you’re living longer, your skills are longer, you’re more skilled as you get older, and you work hard—you know, you have the health to work. Now, you know what? That’s reversed in this country too. Mortality’s getting worse in this country. You know, labor force participation because of health, and opioids, and so if you—so this stuff, cumulative, over time, in totality is why we have these problems. Because if you look at the—this is exactly what people are worried about. Their cost of health care. Their wages aren’t going up. We don’t train our kids properly. And if we fix these things, you actually fix all the other things. And so that’s why I took the time to write it, because I really do think we’re just off base. And we’re guessing, and we know what the answer is. DIMON: I torture—I mean, I have a—I don’t know, I probably spent five complete weekends and then ten other half-days, or something like that. DIMON: But the other thing about this, which I—you know, and the Warren Buffett thing. I read his. And I also ask myself: What do you want to know? To my shareholders, I ask our employees, what do you want—what’s important? What decisions am I trying to make that I have never explained properly? You know, now I have a section about AI, and cyber, and privacy, stuff like that. And it makes me actually work over, and over, and over so I can explain it in a way that everyone understands it, so it helps policy for the company for me to go through the exercise. And then even the policy stuff, we do affordable housing. We’ve gotten into the health care venture. We do a lot around work skills now. We do a lot around—the BRT is willing to fight on immigration when the time comes. So it does help inform me on what we could be doing to help as a nation, help our country. DIMON: I am not scared. I modify certain words. And sometimes I put stuff in there just to piss them off, right? (Laughter.) So the read the early drafts, I’m just railing on something or other. You can’t say that. I said, yes, I can. I know damn well I’m going to take it out in the final draft. DIMON: But they have fun and they get better—and we do research to answer it sometimes. RUBENSTEIN: And you have a JPMorgan credit card, I assume. RUBENSTEIN: Have you ever had it denied when you go out? (Laughter.) Has that ever happened? DIMON: Yeah, I have, actually. RUBENSTEIN: Really? What did you do? DIMON: It happened an embarrassing thing, because I was up at Harvard Business School taking my daughter’s—she went to Harvard Business School too—her friends out, or something like that. And they turned me down. RUBENSTEIN: So do you call up somebody and say, like, do you know who I am, or something like that? DIMON: I don’t bother doing that. I just asked another person to pay, say I’ll send you some more money. (Laughs.) I didn’t want to go to the phone and have the whole conversation. RUBENSTEIN: And you say in here one of your biggest concerns is cybersecurity. So you spend an enormous amount of money on making sure that your information is going to be kept private. DIMON: Well, not just information. It’s we spend $600 million a year, three thousand people, you know, 24/7 around the world. And that doesn’t include all the physical and all the other things we do monitoring our own—so there’s a lot of things not in that that we do. We monitor our own people. We know what you’re doing everywhere all the time, much more than people think. And we have no choice, to protect the company and access systems. And then, of course, there’s hygiene. You know, there are a million—that thing I just said about card? That’s true about anytime you move money—like, corporate money, stock, bond, you name it. And there’s tons of tests, and tripwires, and kill switches, and passwords, and, you know, constantly doing things to help that. RUBENSTEIN: OK. Questions? Please stand up, identify yourself, your name, your organization, ask a question not a statement. And, OK, right here. Jay. Q: Hi. Great panel. Jay Koh from the Lightsmith Group. I read your letter with great interest. And it’s great that in the aftermath of natural disasters there’s a lot of humanitarian responses from the bank. And the call for infrastructure I think is something that’s way overdue. My question is this: These things all seem to implicate the kind of now-unfolding impact, practically and from an investment standpoint and from an economic standpoint, of climate change. And so that’s one thing that I don’t think—you know, flipping through your letter emerges discretely there. I know that you guys are involved in things like the Taskforce on Climate-Related Financial Disclosure. But I wanted to see if you might comment on the impact of climate change, or how you’re thinking about it in the operations of one of the most important financial institutions in the world. DIMON: In one of the sections there I go through what we do for employees, OK? The minimum wage is, like 35,000 (dollars). Medical, dental, pilates, gym, wellness programs, enormous training, veterans programs, advancing back leaders. We’re at 50 percent in black MDs in the last two years. That’s how good we’ve gotten at it and using a lot of different stuff. And so the reason I say that is because the point about these rapacious companies. You know, these companies treat people exactly the way that some people say. Wages, we do it. Medical, we do it. Training, we do it. Promotion, we do it. Across a broad—and most big companies do, by the way. It’s just this whole notion is just dead wrong. And climate change, I had a paragraph at the start. So here’s my view: Is that we don’t—at JPMorgan we have risk committees, and green stuff. And we’re going to be 100 percent green ourselves. We’re very careful who we do—how we do it. I didn’t pick it up because it’s hard to have a policy around that. So here’s my own view, OK, is that I believe that this carbon dividend, carbon tax—which some of you may have seen George Shultz and Jim Baker and, like, eight secretaries of state, former secretary of trade signed onto it. Bob Rubin, I don’t know is in the room. I think it’s brilliant. And that is the solution. And so I personally would support something like that. And the company may say we support proper policy to start reducing CO2. I do think it’s an issue. So I wasn’t avoiding it. I just—there’s only so much I can write, you know? So there’s one issue I took off. And the BRT may take up that issue too. Like, I think it’s OK for us—even if—even if we’ve got very detailed policy saying we support something like that. Some of these—you know, and we need policy that works. That policy could actually work, and get around the politics of, you know, you may more than you. RUBENSTEIN: OK. Other questions? Right back here. Speak up, identify yourself, and simple question. Q: Well, good evening. My name is Stephanie Ma (ph), and I am a financial reporter of Xinhua News Agency. As we know that there is—there has recently been increasing penetration by global investors into China’s bond market. And as we know, China is also on the whitelist for JPMorgan’s emerging market global bond index, Global Diversify. So what do you make of the potential of China’s bond market? And what’s your expectation on China’s weight in your index in the future? Thank you. DIMON: So China—you know, you got to give China fair and balanced assessment, because people just—China has done a great job going from, you know, 200 people—per person to 10,000 GDP per person. And you know, they started way behind and stuff like that. But if you gave a fair assessment, you know, just think, they don’t—and this is for the Americans—they don’t have a food war in energy. We do. They have a really difficult geopolitical situation with all of their neighbors—Russia, India, Pakistan, Afghanistan, Vietnam, Indonesia, Koreas. It’s a tough part of the world. They don’t have our institutions. They don’t have our rule of law. They’ve got excessive corruption. They’ve got a lot of inefficient state-owned enterprises. And they know, they talk about these things. And they—and they’ve done—and they’ve been reforming the whole time. Now, they got this trade issue, which I think will be resolved. If it’s not, by the way, there will be serious repercussions for a whole bunch of different reasons. And they’ve been opening up their markets, very slow—you know, Americans want much faster. And they should. I actually—they’re only going to do it in their own self-interest. But this—having that healthy transformational rule of law, better markets. You know, their stock and bond markets are maybe 20-30 percent the size of ours. One day they’re going to have 40 percent of the Fortune 1000. Their market should be equal size of ours, which is why we don’t license do business in Shanghai. We don’t have the full license. We can do it in Hong Kong for a Chinese company. We can’t do it Shanghai for a Chinese company. So they’re going on this path. I think they’re on the right path. Don’t over-care about how much is in the index, OK? They don’t have a fully convertible currency. A convertible—and they can’t yet. So I’m not saying they should. A convertible currency is when you can buy and sell the currency and you can buy and sell assets in the currency. You can buy their bonds, you can buy their stocks, you can sell their stocks, you can sell their bonds. You can’t. Everything that gets done there is by permission of the government. They limit how much bonds you can buy. They limit how much stocks you—they’re doing this to protect themselves. This is not—they’re not ready to fully open up. So they’re not going to enter these indexes in major ways until they’re fully convertible. I don’t think they can be fully convertible for another ten years. And but I do think having really transparent financial markets and companies like JPMorgan will make them a healthier country over time, which would be good for them. RUBENSTEIN: OK. Right here. Please wait—get a mic and identify yourself. Q: OK. Given that Mr. Rubenstein asked a lot of questions about your personal career, I have a more personal question. And that is, how do you balance your time? How do you manage your day? How do you manage your week? And how do you manage your people? DIMON: Yeah. Well, you know, I’m very efficient, OK? (Laughter.) I have flaws. I read fast. I don’t read—I don’t read everything the same speed. I got, you know, this I read fast, and this I—some things you got to read slow to—I think, right? So on Sundays I read slow, I take notes, and I really think about what I want to do, and what I have to follow up—you know, but I think people could manage their time. I think most people are terrible at it. Like, they’re tearing their hair out. They’re senior people. They’re busy. They don’t return their phone calls. I return every phone call, every email, every day. I am never rushed. I’m almost never late. I hate it. Your stomach churns. And in my office, 40 percent—probably 40 percent of my time is white time. You know, my door is open, I walk around, I talk to people. But I always have—but a third of the time is very rigorous. You know, business reviews around the world, business reviews in this biz, risk reviews. And everyone knows. Everyone’s got an agenda—a forward-looking agenda. It’s all scheduled. We do a lot of ad hoc stuff, so everyone knows that takes place. And, you know, people have—if you work for me, you have a follow-up list. I know what’s on it. You know what’s on it. And you better bring up everything important to me. So I don’t—I don’t have these—some executives have this—you know, their once a week sit-down with every person who reports to them for an hour. I don’t do any of that stuff. It’s a waste of time, OK? I know them, you know? If you work for me, I get to know you—I would get to know you. And once I trust you, I’m not going to do all that. I’ll tell you, if you need me, you call me. If I got to tell you something, I’m going to call you, you know? And therefore you don’t have to worry about me all the time, and stuff like that. And so I think people could be really better. But of course, when you have kids—and that’s where it becomes a real thing—my life became binary. Family and business. So I still—we still have family dinners when I’m home. Sunday night, my parents used to go when they were alive. My brother goes, my sister-in-law goes, my mother-in-law goes. Not every Sunday, but I’d say three out of four. And a lot of weekends in the country house, all family. I don’t do East Hampton. I don’t do black tie. You know if you ever see me in a black tie—you know, I just—I don’t have the time. And then I work. I like working. I read a lot on the weekends and I—you know, I travel 50 percent of the time. But I try to be really rigorous about that stuff. RUBENSTEIN: You met your wife at Harvard Business School, Judy. And you’ve been married how many years? RUBENSTEIN: All right. And you have three daughters? DIMON: Three daughters, four granddaughters. I still diaper, right? (Laughter.) It’s just like riding a bike. RUBENSTEIN: And what are your—your grandchildren call you what? RUBENSTEIN: Not Jamie or nothing? RUBENSTEIN: Right here. Right here. Right here. Q: Our lives depend on it. DIMON: You know, I think New York has a problem, OK? And the problem is—and it’s insidious, you know? Which is somehow that a city thinks it doesn’t have to compete. Now, this is the greatest city in the world. I mean, it is unbelievable. But it’s got the highest taxes, individual. The highest taxes, corporate. Probably the highest real estate tax—like, all that Amazon, the 3 billion, that was basically just reducing taxes for the first ten years. I mean, that’s all it was. It was, like, just a discount on the taxes they’re going to pay, and stuff like that. And you can’t survive like that. So some of you may have lived in the city in 1974, you know, with unemployment at 12 percent. I think this is right, ten of the Fortune 50 companies were headquartered here, left. JCPenney, Exxon, American Airlines. And I think it’s a bad idea to abuse the things that create so much wealth and stuff like that, and to assume—the arrogance to assume that’s forever. Now, it is a great place. And we have four thousand people on the West Side, you know, all technology people—Asian, Indian, black. It’s unbelievable. From the schools and—and so it’s still a great place. But I think the right way to run anything is to run it knowing that you’re going to have competition. You should prepare for that. So the other thing about budgets, you know, we lie about pension plans. You know, we don’t—I mean, if we even told the truth about it, you know, it would make you sick to your stomach about the commitments that are not funded, or even reported. And so those commitments made by cities and states are a problem. And they’re not tomorrow’s problem, but. RUBENSTEIN: We have one more question, right here. The lady in the back. One last question, and then we’re out of time. DIMON: Hi, David. Thanks. And thank you, Jamie. Christina from CNN. I got to ask, what do you think of Stephen Moore and Herman Cain for the Fed? DIMON: You know, I’m going to demure. I don’t—I know them from seeing them on TV, you know. So I’ve never sat down and had a long conversation. And you know, they don’t seem like they’re the right people to put on the Fed. I do think Jay Powell is very bright. And I think the Fed people—I don’t agree with everything they’ve ever done, but I think they’re very bright people trying to do the right stuff. I don’t think they’d be pushed around very much by tweets or words, and all that. And I also think that’s a necessarily good idea. You know, of course every president wants rates lower. I mean, I get surprised when the press says: The president said this. Oh, really? The president wants lower rates, and that shocks you? (Laughter.) You know, what president would say I want higher rates? So, look, they should put professional people those. Those—I think those jobs all have to go through confirmation. Let the senators do their homework. RUBENSTEIN: So as you look back on your incredible career, any regrets or what are you most pleased with? DIMON: I’ve had a—I’ve had a great life. You know, all of us make—I mean, if you—if you wanted, I could spend hours here talking about my mistakes. And you learn from those. I mean, the biggest—the biggest regrets are people mistakes you made that hurt the company, that took a long time to correct. You should have seen it. They hurt people, which now I’m responsible for. I hired bad people, and they hurt you, and I feel terrible about it, or something like that. It wasn’t this trade, or not even that stupid London Whale thing, or a merger we had some extra difficulties on. It was usually around hard people things. It’s tough to be a CEO. The people stuff becomes the toughest stuff. And the mistakes were always I didn’t speak to the right people enough, I didn’t do my homework, I didn’t take the time. You were angry. Like, anything done out of anger is a bad idea, you know? And so those—I don’t make those every day. You do learn as you get older. There’s certain things you’re better off not doing. So, you know, people write—sometimes the press writes here, Jamie’s very decisive. If you work for me, on certain issues we torture the subject over, and over, and over until we think we have it exactly right. That could be a medical policy. That could be an underwriting policy. That could be whether we’re going to enter a new country or we’re going to do a $20 billion bridge loan. I want to get some things exactly right. And we work the angle. And, you know, your error rate drops like this when you get the right people in the room, share the information, get rid of the politics, give yourself the time, don’t rush to judgement. And it’s amazing. RUBENSTEIN: Thank you very much.